Imec, the world-leading research and innovation hub in nano-electronics and digital technology, will demonstrate today at its Imec Technology Forum in Antwerp (ITF Belgium 2018), a new wireless eye-tracking technology based on electro-oculography (EOG), an ophthalmology technique used to examine eyes and record eye movement. The technology, which is integrated into a standard pair of eyeglasses, can significantly improve augmented reality and virtual reality (AR/VR) experiences. Moreover, imec aims to employ it for clinical research on neurodegenerative diseases. Imec’s EOG technology utilizes five dry-contact electrodes mounted on a standard pair of eyeglasses. The electrodes detect the eye-movement, while the ergonomic design gives the wearer the comfortable familiarity of every-day glass frames. It is less expensive and less bulky compared to state-of-the-art AR/VR headsets with eye-tracking capability. Moreover, imec‘s novel approach can achieve a sampling rate of 256 samples per second, making it more than twice as fast as current camera-based solutions for detecting eye position. Based on Bluetooth wireless technology, it is more energy efficient, requiring only one battery in a small box behind the wearer’s ear. Another small box includes the electronics. Imec’s EOG technology can be used in AR/VR applications to navigate interfaces and menus quickly by the user’s eye gestures, eliminating the need for cumbersome hand controllers. An advanced algorithm translates the eye movement signals into virtual commands: lateral eye movements can for example be used to swipe and turn, while blinking will trigger a move forward. Moreover, eye movement analysis has been increasingly used in studies on neurological disorders, resulting in scientific evidence that eye movements are affected by neurodegenerative diseases such as Parkinson’s disease or Alzheimer’s disease, even at an early stage. With this in mind, imec aims to employ its technology for clinical research on the early detection of neurodegenerative diseases and monitoring disease progression. Imec will demonstrate the EOG glasses at its annual ITF event, which takes places in Antwerp (Belgium), on May 23nd – 24rd. 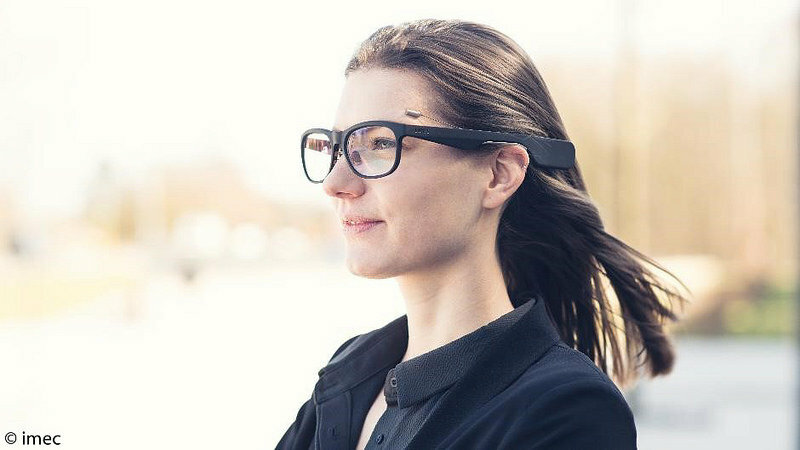 Attendees will have the opportunity to find their way through a maze wearing the EOG glasses and using only their eye movements for navigation.